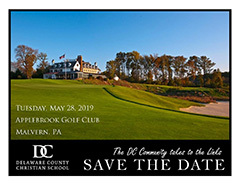 10th Annual DC Golf Classic to Benefit Delaware County Christian School! Join us on May 28, 2019 at the Applebrook Golf Club in Malvern. With rolling hills and picturesque views, Applebrook Golf Club provides one of the most unique atmospheres available for golf enthusiasts. The beautifully manicured championship course is set on farmlands originally deeded to the area's first settlers by William Penn in the late 1600's. After finishing your round, take in the scenic views of the course from the club's outdoor patio while you enjoy a spectacular dining experience. We look forward to sharing the Applebrook experience with you! You may register as a golfer, a sponsor, or both! The success of the tournament depends largely on the support of our sponsors. We are thankful for the vision and participation of these sponsors and pray that God will continue to bless them and their businesses as they have been faithful in blessing others. Questions? Please contact Tom Corcimiglia at tc@thephiladelphiagroup.com. Sponsored by the Delaware County Christian School - All proceeds support DC athletic and arts programs and funding for the Distinguished Faculty Awards given annually to three teachers who are selected by their peers for excellence in teaching. Complete the registration form to RSVP and purchase tickets and/or be an event sponsor. Each golfer receives a $50 gift certificate to the Applebrook Pro Shop. SPECIAL THANKS TO PANCOAST-CLIFFORD FOR THEIR SPONSORSHIP! Please Select…Yes, I want to help sponsor the outing. How did you hear about the DC Golf Classic? Payment information will be collected after you click Submit.